Skunk brought these flowers home for me the other day. Very sweet of him, and aren’t the colors cool? 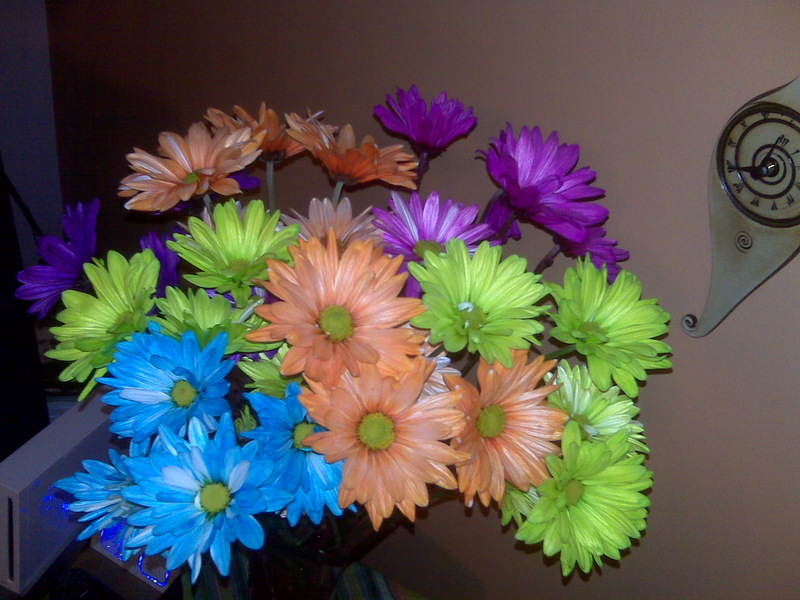 They get the color by adding dye to the water the daisies are in, and whalla, colorfully funky daisies. I really like funky things. Seeing the daisies I realized that we are all a lot like while daisies. We come into the world fresh and mostly undamaged, blank but beautifully colorless. Then gradually, the things we are nurtured with develop how we show up in the world, and what colors we become. We may take in positive feedback from parents, teachers, and other influential sources, allowing ourselves to become beautifully vibrant and full of color. Some parents may try to keep us white and safe by sheltering us from things, or hurriedly running about trying to pick up the petals that fall as we grow. Others may try to stomp on us, tear our leaves, and do damage that is hard to repair. But our job is only this, to bloom, not to become the color that someone else hoped for us, but to simply become. Sometimes I look back on my years and wish I could again be a white daisy. I wish certain things did not happen, and that some of my leaves weren’t quite so damaged. Other times I recognize my own petal colors, and feel grateful for the journey that has spread those colors. But more special are the rare times that I am able to see fully that I am not only colored by my experiences and choices, but that I am still that white daisy at heart, still able to embrace the possibilities of today, and determine my color for tomorrow.